Treadmills are a ubiquitous mainstay in the fitness world thanks to their many health benefits. They’re also great machines to have in your home gym, encouraging regular cardio sweat sessions. In this piece, you’ll learn how to make the most of your treadmill, what to consider when buying one, and what we selected as top picks for the best treadmills for home. The foldable and portable design, combined with the high-capacity motor make this a great choice for your home gym. The Merax is the perfect choice for you if you need a quiet but powerful motor, and an overall small footprint. The running deck is also cushioned to protect your joints. A compact design with a motor that supports speeds up to 10 mph, the Weslo is a great choice if you have limited space and a limited budget. A powerful motor, up to 10% incline, and a large tread belt make this the ideal choice for you if you love running. A variety of 20 built-in exercise programs designed by personal trainers will keep you challenged. 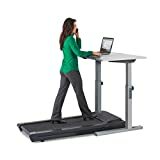 If you’re looking to be more active during your daily life, this treadmill desk is a great pick to increase your activity levels while working. It’s compact but powerful, making it an ideal choice for your home office. Solid construction and a high-quality flywheel make for a challenging self-powered workout. It also folds up compactly for easy storage. Loaded with a variety of workout programs to help you lose weight and get fit. It’s quiet, compact, and foldable, making it an ideal fit for smaller spaces. The Weslo doesn’t skimp on features, even at the lower price point. Comes with 6 integrated workouts to help you torch calories. iFit compatibility ensures that you can always get the latest workouts. A quiet and powerful motor makes this treadmill perfect for shared office spaces. This treadmill doesn’t require electricity to work, so there’s no motor, making it compact, light, and quiet. Some have reported issues with the speed sensor, meaning that your walk or run may not be as smooth as you’d like it to be. The running deck is more fragile than on some other models, so if you’re on the more muscular and heavier side, you’ll want to choose another model. The tread is on the smaller side, and the overall weight capacity is only 275 pounds. That makes it less ideal for you taller and heavier workout enthusiasts. The only con is that this treadmill uses a lot of power due to the large number of features it boasts. The motor can be a little fickle and may require more maintenance than other treadmills. The maximum weight capacity is only 250 pounds and the overall frame is a little more flimsy than some competitor’s models. To lose weight. Regular cardiovascular workouts can help you shed pounds, and running, jogging or walking on a treadmill can help you achieve that. It’s all about the target heart rate and fat burning zone. When you’re exercising in these zones for at least 30 minutes on a regular basis, your body will burn fat and you’ll lose weight. To increase mobility. Research has shown that low impact exercise, like walking on a treadmill, improves your health and mobility. Walking at a comfortable speed for a longer duration showed the best results in becoming more mobile, especially after illness or injury. Keep warm indoors during cold winter months. Having a treadmill at home is great for avoiding the cold outdoors during chilly winters and still getting your jog or run in. It also spares you from having to drive to a gym, and will save you tons on membership fees. To control the distance and duration of the workout. Treadmills are incredibly convenient when it comes to controlling the exact parameters of your workout. In the mood for a short but intense run today? With a treadmill, you don’t have to worry about finding a new route that delivers the run you want. Instead, just crank up the speed, adjust the incline, and go for it. Less impact than running outside. It’s no secret that running on concrete or asphalt isn’t great for our joints. The good news is, most treadmills are cushioned to better protect your joints, so you can get a great workout with minimal injury risk. A motorized treadmill has a running belt powered by electricity. This type is sturdy, large, and durable. 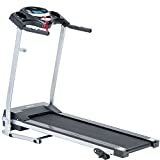 Typically, such a treadmill will have a number of adjustable features, such as incline, speed of the belt, and multiple preset workout programs. Motorized treadmills are made to be long-lasting and will withstand the beating of regular heavy use. Materials tend to be heavy and high-quality – just like you see at the gym. They come in a variety of different sizes, so you’ll be able to find one to suit your needs. Unlike motorized treadmills, manual ones don’t use any electricity. The belt starts once you start moving, so you’re doing all the work. That means you’ll be getting a great and satisfying workout every time. You’ll also have a lower injury risk, since the belt doesn’t move on its own. If you’ve never used a treadmill before, a manual one is a great first treadmill. They’re small and storage-friendly, easy to use and bring big results. Treadmill desks are designed to encourage a more active office lifestyle. Instead of sitting down and working, you walk on a treadmill with your desk in front of you. The treadmill itself is compact and meant to fit under a standing desk. This type of treadmill is great if you like to keep active. That being said, this type is really best for you if you have experience walking or running on one. Hybrid treadmills combine two pieces of exercise equipment into one. Common combinations include a treadmill and stair-climber, a treadmill and elliptical, and even a treadmill to help you lift weights. They’re designed to make switching between the two features quick and easy. They’re also built to last a long time and are great if you tend to get bored with exercises and want to switch things up often. Treadclimbers are great alternatives for walking, but not running. Their max speed is usually under 5mph. NordicTrack treadmills come highly rated. 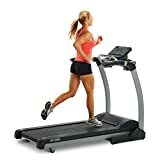 A very popular brand, NordicTrack produces a wide variety of treadmills, from commercial-quality running ones to incline trainers and folding models. If you’re looking for high-tech features, NordicTrack has a variety of cool add-ons and accessories. All of their treadmills come with excellent warranty and money back guarantees. ProForm has been around for 30-plus years, with the mission to integrate the latest technology into world-class exercise equipment. That translates into high-quality treadmills with lots of cool features, perfect for you as an at-home workout enthusiast. ProForm makes a number of different models, suitable for a variety of budgets and lifestyles. LifeSpan makes treadmill desks and bike desks for your office needs. They come with a variety of different features, including their Intelli-Guard safety feature. The modular design of their treadmills is guaranteed to fit into your work environment. Weslo treadmills are budget-friendly entry-level models that are great for home use. If you’re looking for a treadmill without a lot of extra features, Weslo treadmills are a great choice. These are also more compact than a lot of competitor models, so will work great for home gyms with less space. Gold’s Gym makes a handful of different treadmills. These are all priced in the mid-range, between $500 and $700. Stocked with a number of cool features, Gold’s Gym treadmills are made from high-quality, durable materials and guaranteed to last you a long time. $250-$500: This is the budget treadmill price point. Treadmills in this range tend to have shorter tracks, weaker motors, and top speeds of around 10 mph, which makes them more suited to walking and jogging. $500-$1000: At the midrange, treadmills start to have some additional features. Here, you’ll get a 55” or 58” belt, most commonly, and even a 60” belt in some models. You’ll also find better materials, a higher weight capacity, and built-in exercise programs. $1000 and up: At this price point, you’re in the luxury category. These treadmills are virtually maintenance free, have lifetime warranties, and have lots of useful features. Many will have integrated cable TV and Internet browsers, as well as steep inclines, excellent shock absorption, and multiple workout programs. Consider how much interior space you can dedicate to housing your new treadmill. Most come with a footprint of around 77” (length) by 35” (width). Some models can fold for better storage, which brings the overall size down by 50%. For safety and easy access, you’ll want to leave about three feet of open space all around your treadmill. This will give you the best user experience. Keep in mind who will be using the treadmill and what kind of load your treadmill can handle. In terms of body-weight, most models can accommodate 250 to 400 pounds. Some can even withstand 500 pounds of weight. Make sure you choose one that fits your unique needs. Are you planning to use your treadmill for walking, jogging, running, or do you want to mix up different exercises? Walking and running have different stride lengths, and the treadmill’s tread needs to accommodate that. For walking, a tread length of at least 50” is necessary. Running takes at least 55” of tread, and, if you’re tall, you’ll want a 60” tread or longer. Higher running speeds require a more powerful motor, 2.75 horsepower or more. The heavier the treadmill, the more stable it will be. However, sturdier models do tend to take up more space and are more difficult to move around. The longer tracks found on running treadmills are often more stable than shorter tracks. Keep in mind that delivery is often not included in the final price of the treadmill. These costs vary, but will generally be in the $100-$300 range. Likewise, the heavier the treadmill, the more expensive it is to deliver. These heavier treadmills may also require multiple people to set up and properly position in your home. The majority of treadmills on the market arrive mostly assembled. Folding treadmills tend to be folded in the box, and minor installation of accessories may be required. Overall, assembling your new treadmill is a fairly simple task, and you’ll be on your way to a great cardio workout in no time. Low-end treadmills require periodic lubrication to keep the rollers moving smoothly. The best treadmills are maintenance-free, as they use self-lubricating components. Even the best treadmills will need their belts replaced after a lot of use, so be prepared for that cost somewhere down the road. Some treadmills are more adjustable than others. To get the best, most effective workout, you’ll want to buy a treadmill that adjusts to your needs. Speed is one factor here since most models can change the speed of the track. Top speeds are generally between 10 and 12 mph. Likewise, you’ll want to consider the adjustability of the incline, which tends to range between 10 and 20 degrees, but some models can reach 40 degrees. Lots of treadmills come with built-in preset workout programs that change your exercise challenge automatically. These are great for keeping your body challenged and avoiding plateaus. Higher-end treadmills feature more advanced settings so that you can quickly and easily create your own programs. The best displays are big and easy to read while walking, jogging, and running. You’ll want to be able to easily tell how far you’ve run, how many calories you’ve torched, and how long you’ve been working out. Treadmills with such control panels make your exercise experience better. Large buttons also make it easier to change settings without stopping the flow of your workout. Most treadmills have a built-in heart rate monitor in the handles or using a separate but integrated armor belt device. Higher-end models are even compatible with some wireless heart rate monitors. If you’re someone who always targets the fat burning zone, knowing your heart rate will be a great tool. Depending on the model, some treadmills can connect to wifi to use sites such as iFit to download new workouts. Higher end models sometimes feature Bluetooth connectivity to control workouts, music, and settings with a separate app. Charging docks for smartphones and even tablets are now fairly common on mid-level and high-level treadmills. Some models have displays that allow for interactive features, such as workout videos. Unique services like Passport Virtual Active immerse you in a workout video to keep the exercise interesting and challenging. Lightweight, folding treadmills with built-in wheels are easiest to store away when not in use. The more durable treadmills will also be heavier, and less made for storing. A permanent spot in your home gym is needed for these. Higher-end treadmills feature more padding in the belt to make exercising more comfortable and safe. Some treadmills even have additional padding on the handles and grips to make your workout as enjoyable as possible. Warranties differ by company. Some offer lifetime warranties on treadmill parts, such as the belt and motor, while others only offer 10-year warranties. Generally, electronic components have 5-year warranties. This LifeSpan treadmill is a best seller for a reason. It is foldable and portable, which makes it easy to store to keep your home gym uncluttered. It features a heavy-duty, high-capacity 2.5 HP motor, a large 20” by 56” belt, and 15 levels of incline. A variety of 21 programs help target weight loss, healthy living, and sports training and comes with Bluetooth connectivity. There is a Lifetime warranty on the frame and motor. Thanks to the durable construction of this treadmill, it has a 300-pound user weight limit. A drawback of this treadmill is that some issues with the speed sensor have been reported. That means that your treadmill may have issues with controlling the speed of the track. Likewise, the track is not as large as on some other models – if you’re heavier, you might run into some problems. This Merax treadmill is the perfect size for smaller home gyms. It folds up easily and has built-in wheels to transport it to storage. The multi-functional display allows you to track speed, distance, heart rate, and calories burned. The motor is extremely low noise, making it perfect for apartments. Also has a safety stop key. The running deck is cushioned to protect the ankle and knee joints, as well as your lower back. A number of preset workout programs are integrated into the treadmill to help you meet your fitness goals. It also comes with a one year warranty. This treadmill is not the ideal pick for you if you’re muscular and heavy. The running deck is more fragile than on some other models, making it more likely to break with frequent use. A true space saver, the Weslo treadmill is compact and folds up in one easy step. It has a motor that supports speeds up to 10 mph, an integrated tablet holder, and a convenient weight limit of 275 pounds. Featuring a 2-position manual incline and 6 integrated workouts, the Weslo can help boost your athletic performance. The tread itself is on the smaller side, as it’s only 50” long and 16” wide. That means, if you’re tall, you might have some difficulty using this treadmill. Warranty consists of one year on the motor and 90 days on parts and labor. The main drawback of this treadmill is the difficulty of the assembly. It’s also not the most user-friendly treadmill out there, due to its complicated integrated system. Get personal trainer workouts with the 20 built-in exercise programs to help you achieve your goals. The incline can be adjusted up to 10 percent to add a new challenge to your runs and target different muscle groups. This treadmill features a 2.6 CHP drive system and comes with a variety of built-in workout apps to track and measure progress. The tread belt is a medium size at 20” by 55” and should work for you regardless of height. This treadmill also comes with iFit compatibility, giving you access to an ever-expanding library of workouts. The controls are all one touch and easy to use, and the warranty is unbeatable: lifetime on the frame, 25 years on the motor and 1 year on parts and labor. Due to the number of features and the power of the motor, this treadmill required a 20 amp outlet to run properly. If you’re looking to be more active during your daily life, this treadmill desk is a great pick for you. It combines a compact motorized treadmill with a large surface with a height adjustable standing desk. The electric motor is quiet and works smoothly. Portable wheels keep the whole treadmill lightweight and mobile. Even though it’s a compact model, it comes with a console that includes metrics like distance traveled, calories burned, walk/run time, and step count. This treadmill is Bluetooth enabled, allowing you to sync your activity to your smartphone using the Active Trac app. The only real drawback of this treadmill is that the motor can be a little fickle and requires more maintenance than other machines. You should be alright if you keep everything well-lubricated and in good condition. 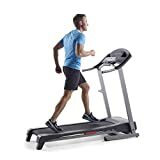 As far as manual treadmills go, this is one of the best in class, thanks to its heavy-duty construction and excellent quality weighted flywheel. The belt is a solid 41-by-13 inches. This treadmill folds and locks into an upright position, making it an ideal choice for you if you’ve got limited space in your home gym. This treadmill lets you achieve great results through a self-powered workout. The belt moves in response to your speed, so it’s always a comfortable motion. Maximum weight capacity is 250 pounds. Single-button electronics help track distance, time, calories, and speed. The Phoenix comes with a 90-day warranty on the parts and a one year warranty on the frame. Compared to some other models, this one feels a little more flimsy. If you’re looking for something sturdier, a different treadmill would be the way to go for you. This ProForm treadmill is commercial grade and designed to go the distance. It features a 3.5 CHP pro motor that can achieve a top speed of 12 mph. It also comes with a 7-inch oversized backlit display, 32 workout apps, iFit Compatibility, and iPod compatibility. The treadmill can be adjusted to a -3% decline and a 15% incline. The tread is also commercial grade and 60-inches long, making it ideal for running. It’s cushioned so that your workout is effective and comfortable. It also comes with a CoolAire workout fan and EasyLift assist to store it away. The only real drawback of this treadmill is its high price point. It might not be the best choice for you if you’re looking for something simple for your home gym. Increase your running cadence (i.e. the number of steps per minute) to improve your running efficiency. Use a slight incline of 1% or 2% to better simulate outdoor running. Avoid holding onto the handles, if possible, for better running performance and a more challenging workout. Keep your body upright and tighten your core while running to maintain balance and strengthen muscles. Buy a treadmill mat to avoid slipping and sliding, and scratching your floors. Q: Is running on a treadmill easier on your body than running outdoors? A: Running on a treadmill tends to be less stressful to the body than outdoor running. Part of this is due to the amount of cushioning a treadmill track offers compared to the asphalt of the road. Since the treadmill absorbs a lot of the impact, it spares your joints. Q: Is it better to run faster with no incline or slower with a steeper incline? A: It’s best to do both. The uphill workouts build strength, while the faster flat workouts tend to build endurance, foot speed, and stamina. For balanced training, adjust both the speed and the incline during your workout, and mix it up. Q: Is it really worth spending a lot on a treadmill? A: That depends on what kind of features you want, how often you’re willing to do maintenance on your treadmill, and what kind of overall experience you seek. The more expensive treadmills will require very little maintenance and will last longer than cheaper models. On the other hand, if you’re just looking to get started running at home, a cheaper one might be the way to go. For the best overall treadmill, we selected the LifeSpan TR1200i Folding Treadmill. Its foldable and portable design, combined with the high-capacity motor, make this a great choice for your home gym. It’s also loaded with a wide variety of workout programs to help you lose weight and get fit. If you’re looking for a budget pick, the Weslo Cadence G 5.9i Folding Treadmill offers the best value for money. It also features a compact design and good-quality motor that supports speeds up to 10 mph. We hope the above recommendations and considerations have been helpful. Now, let’s hear from you. Which models are your favorite and why? Let us know in the comments below!